I plucked out the items I think you all would love the most. 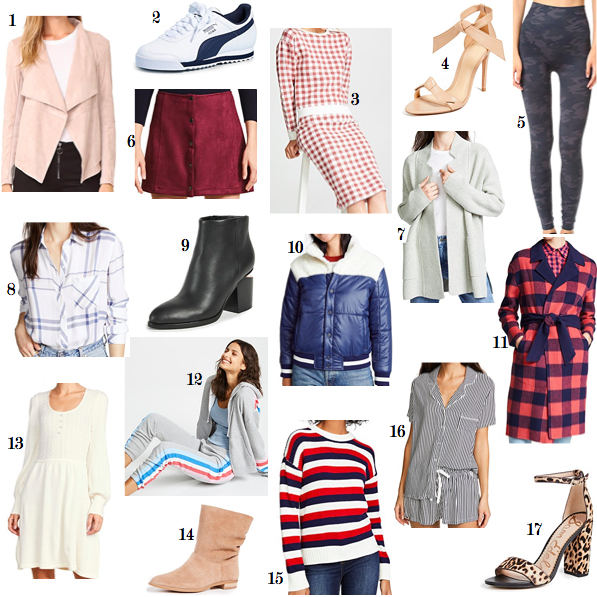 So many fun, interesting pieces that will get you pysched to get dressed. As well as some Fall staples that you will wear to death. Let's just say my cart is full. 1. This drape front jacket comes in a bunch of colors and you will wear it forever. Under $100! / 2. Obsessed with the retro feel of these Puma sneakers (these too) / 3. DYING over this sweater and skirt set / 4. Cannot believe these Alexandre Birman are on sale! Also in white and black / 5. These Spanx leggings are always sold out and have a million rave reviews / 6. The color and texture of this suede skirt is perfection. Also comes in brown / 7. The cardigan you will reach for over and over again / 8. A soft plaid shirt to pair with everything / 9. Have always loved these modern Alexander Wang booties / 10. A sporty and soft puffer / 11. This buffalo plaid coat is on sale and you get the 25% off / 12. Go full sweatsuit in these pants and hoodie (these joggers too!) / 13. A pretty sweater dress / 14. Cool girl booties for skinnies, tights, and leggings / 15. A new riff on the striped sweater / 16. The softest PJ set / 17. LOVE these leopard block heels! There is SO much more to see on the site too. Like these, these, these, this, and this.